Posted January 15th, 2017 by Cecilia Wong & filed under Art, Articles, Science. 1.6 million-year-old stone handaxe (British Museum) from the Olduvai Gorge in Tanzania. 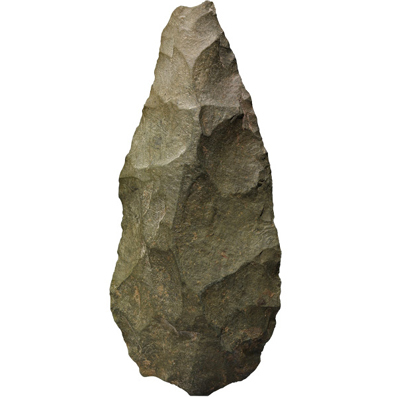 Stone knapping was what Homo erectus (Java Man, Peking Man) did to make this handaxe. This invention made erectus the very successful species that it was, living for 2 million years until about 100,000 years ago – hunting and carving up animals. They died out after we, modern Homo sapiens came along because we were smarter than they were. But we’ve only been around for 200,000 years. Monkeys do indeed possess some mathematical skills on par with college humans, see link. This means that there is a primitive system for non-verbal mathematical thinking that is conserved in human evolution. A monkey’s skills, as were those of Homo erectus, involve simple needs: how to get food and run away from danger. So it is not surprising that neurons in the brain’s IPS (intraparietal sulcus), a part of the visual dorsal stream for form, action, and location of objects also respond to numerals and quantity. So here we are back to Cézanne’s paintings. In my last post, Cézanne the Neuro-artist, I suggested that Cézanne had used the visual dorsal stream in looking at the scene and making his paintings. He was representing nature (the trees, rocks, and houses) – but from a viewpoint that very few people (including artists) actually use: unconsciously looking at and rendering structure and form via peripheral vision (largely unconscious). This explains why his apples suggest apples but are not like traditional realist paintings. Neither are his landscape paintings made of spheres, cones and cylinders that are apparent in Picasso’s analytic Cubist painting like Harlequin’s Family (1908) (he was inspired by Cézanne). Alfred Barr in his 1929 MoMA catalog suggested that Picasso had taken one aspect of Cézanne’s paintings, the “…abbreviations and angularities which approached geometry” because Cézanne had remarked that “…the fundamental forms of nature were the sphere, the cone and the cylinder…”. I believe Cézanne was talking about how he observed forms – the shadows that change with the sun’s angle or the wind – not the shapes he painted. Cézanne called himself “The primitive of the way which I have found”. Indeed. He found the primitive visual pathway for action and spatial memory – the dorsal ‘where and how’ pathway in our brain. It is also the brain area that has recently been found to be involved in numeral calculations. Chinese words, unlike English, are pictograms – defined by brush strokes (always moving in same order, left to right, top to bottom) within a square, not by a linear string of letters. It is not surprising then, that the visual-premotor area is involved – a sort of mental visual-spatial action. (I imagine the native Chinese speakers would add and subtract a little faster too). Visual-spatial skills have been found to correlate with students’ general achievements. A 2013 study from Missouri has shown that fifth graders score higher in math, intelligence, and general attentive behavior if their visual-spatial skills have been greater since first grade. See report here. Looking at art that is less colorful, but more concerned with form and structure can be a way to develop visual-spatial skills. Sketching from life too, would be beneficial as a more active learning process. Looking, and seeing, with our own eyes, unfiltered by preconceptions, is what learning is about – mathematics included.